Classic camera phone with all the messaging you need, fast moving games, and computer synchronisation. The K300i is ease of use, stylishly packaged. One press on the camera button, and the camera is ready to use. One more and your picture is ready to send. A simple function lets you switch to video mode when you need to capture some action. The K300i has entertainment for everybody. Use an original artist Music tone as your distinctive mobile phone sound. And when you need some excitement, challenge a K300i Java� 3D game. Fast-moving and fun. 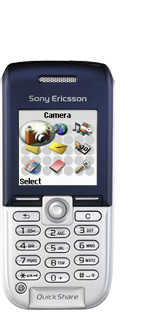 Coolnewmobile - Offering the latest Contract Phones including the Sony Ericsson K300i at the most competative prices around. We offer fantastic mobile internet phones all with FREE text messaging*, If you want an O2 mobile phone why not buy it now from O2. They also have some good deals on the Sony Ericsson K300i.